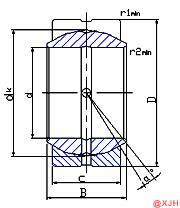 Spherical Plain Bearing GE.ES Series has a large spherical sliding contact area and a large angle of inclination. It also has special processing methods for most joint bearings, such as surface phosphating, galvanizing, chrome plating or outer sliding lining, and inserts. , spraying, etc., so it has a large load capacity and impact resistance. In addition, it is also resistant to corrosion, abrasion, self-aligning, lubricated or self-lubricating and non-lubricating dirt, even if it is misplaced. Therefore, the Spherical Plain Bearing GE.ES Series is widely used for low-speed oscillating, tilting and rotating motions.